The Empire Film Music Ensemble (EFME) was established by Eastman School of Music undergraduates, Dylan Price and Michael Staffeldt in the fall of 2013, in the pursuit of their dream to perform film music in concert settings. Now, the ensemble aims to strengthen the value of film music as legitimate concert repertoire through education, community outreach, collaborative performances, and recordings of artistic merit. Under the guidance of its founders and with the dedication of over 70 passionate musicians from across the Eastman School and University of Rochester, EFME has put on six multimedia performances in various venues across Rochester, Grand Rapids, and Detroit. The orchestra has collaborated to create unique concert experiences with composers, filmmakers, and musicians from the University of Rochester, Rochester Institute of Technology (RIT), and Berklee College of Music. Two successful Kickstarter campaigns in 2013 and 2014, as well as generous private and corporate donations have made these projects possible. In 2015, the orchestra recorded for the online TV series Star Trek Continues, composed by Juilliard faculty member and composer at Duotone Audio Group, Andy Farber. Their most recent performance was a collaboration with Emmy Award winning composer and Eastman alumnus Jeff Beal. Below are excerpts and pictures from their Spring 2014 concert titled, “Summon the Heroes”. 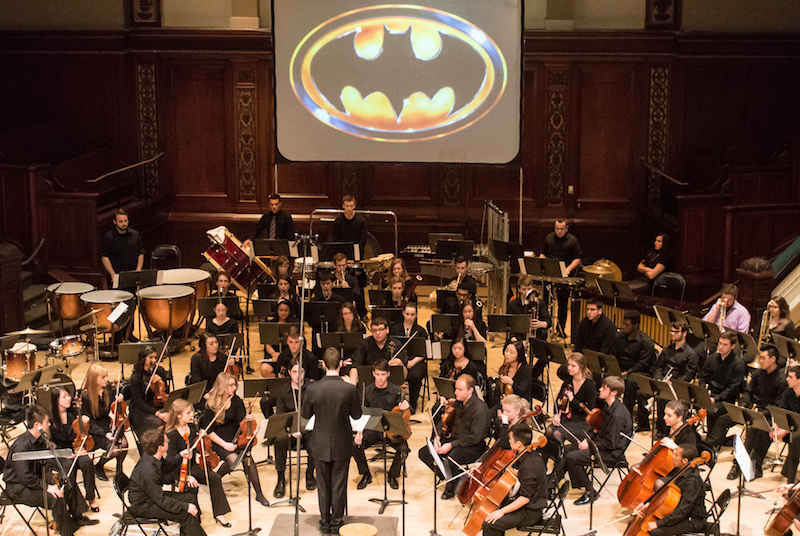 The concert featured music from movies such as Batman, Spiderman, Hercules, etc. and showcased vocal soloists from the Eastman School of Music and the University of Rochester a cappella group, the Yellow Jackets. For more information, check out the EFME personal website, www.empirefilmmusicensemble.com.